One of my favourite fairy tale story as a child growing up was jack and the beanstalk. This fairy tale had a very adventurous storyline that always kept me on the edge of my seat as to what was about to happen next. For most of us if not all of us know how the story ends with jack slaying the giant, both him and his mother getting the golden goose of the giant that lays the golden eggs and in the end becomes very rich. I believe that this is a good way to end this story of a boy and his mother that struggled until they arose from rags to riches. But if it had not been for those magic beans that Jack traded for their cow that his mother sent him with to market to sell even though upset when she found out what her son did jack would have never had those magic beans that grew into a large beanstalk overnight that lead to this adventurous journey. How good it would be to have beans like these that suddenly sprung up overnight and lead us to our golden goose without the giant of course. But this article is not about seeking to get our goose that lays golden eggs even though that would be nice but about growing beans that are so beneficial to our health. 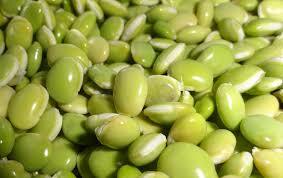 I love adding beans to rice and soups because they are very delicious. There are many types of beans that it is just mind-blowing. 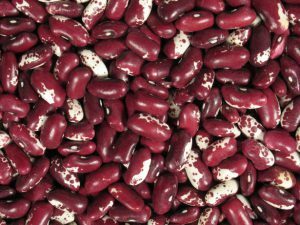 The good news about beans besides their taste is the vitamin content along with the benefits they have. But what’s the process of growing, caring and harvestings beans? When planting beans plant in full sun because beans love or thrive best in warm weather. The soil should be a well-drain soil. Soil such as organic soil or compost is great because this of type soil retains the right amount of water and fertilizer for plant health. Beans can grow either as a bush or pole beans. Bush beans grow more compact and don’t require support while on the other hand pole beans need support and are supported by trellises or stakes. Bush beans can have a spread of up to 2 feet. Therefore proper spacing of bush beans is important. Pole beans grow or climb like a vine and reach heights of up to 12 or more feet. The seeds should be planted to a depth of 1-2 inches and 3-4 inches apart. I have also seen beans planted near and growing on chain link fences and doing very well. Keep beans well water, don’t saturate the soil just moist enough so the soil doesn’t completely dry out. Using a well-balanced fertilizer will go a long way in keeping your beans growing healthy. Treating with insecticidal soap sprays, or a mixture of a teaspoon of dish liquid to a 32 oz bottle sprayer filled with water or using an organic insect spray will treat these insects. When harvesting beans look for firm pods that are sizeable. Also, mature beans will snap when removed from the stalk. Growing, caring for and harvesting beans are really simple. Following these steps will ensure that you are successful when it comes to growing beans so make beans are a part of your spring garden and reap a good harvest of your labour. Thanks for this useful information. I started using planter boxes last summer and plan to add more since they did so well. Do you think beans would grow well in a raised planter box? I have them in a location where they will get full sun. I only grew tomatoes, cucumbers, squash, and bell pepper last year and they did real well. I was thinking about adding some green beans this year. I enjoyed reading the your section about Jack and the Bean Stalk as well. That was also one of my favorite stories. Hello Devara so good to meet you. It is so good that you are growing your own produce. When it comes to beans they need space to grow but it is worth a try there is no harm in that. Please let me know how it goes. Have a good day. Hi Norman, nice seeing this easy tips for growing beans. I love the story of the small boy too, it was always exciting to listen and a bit of thrill and dreaming of a better life. I love eating beans very much as well. I like to make a Serbish bean soup every now and then. In Thailand, we also have a great variety of different beans. Some are eaten fresh cooked and some dried first. My wife is doing the gardening here and has some two or three types on the menu. I also love the green long beans they have here, about up to 50 centimeters long and we eat them raw with a rice dish. I’d love to grow these red Indian beans here for the soup but we don’t get the seeds here. Hello so nice to meet you, I am so happy that I could help. Thanks so much for sharing your story. To buy these seeds you could check out amazon. Please let me know how it goes. All the best to you and have a good day. I love beans and had never thought about growing them! What a great idea. I also didn’t know about using dish soap as an insecticide. That sounds like a great way to treat them, without spending a ton insecticides. Probably a little healthier too maybe? Which beans would be the easiest to grow in the smallest of spaces? Hello again my friend you can give the kidney beans a try. Please let me know how it goes. All the best of success and.Have a good day. I love down in Florida and the summer is not kind to growing many plants either due to the heat or the high amount of rain. You mentioned that beans like warm climates. Which beans would be best for the Southeast United States climate? I would like to have black beans if possible. Yes my friend beans love warm climates. Give it a try and please let me know how it goes, Wishing you the best of gardening success.